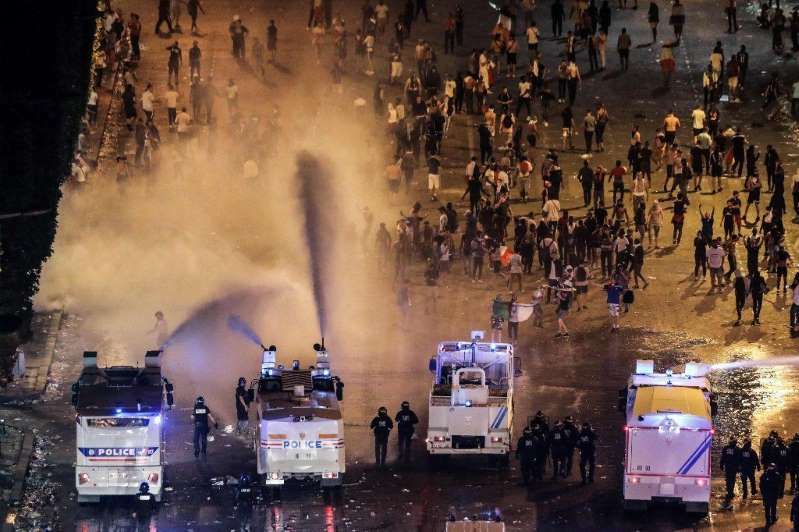 At least two people died and dozens were arrested after France’s win in the World Cup final sparked revelling and chaos across the country. A man in his 50s in the city of Annecy died after he jumped into a canal without enough water in it and in the Oise region a man in his 30s died when he ran his car into a tree during the celebrations of Sunday’s 4-2 victory of Croatia. Beyond those fatally wounded, three children ages 3 to 6 were in grave condition after being hit by a motorcycle, according to the AFP. [post_ads]France was riveted by the success of “the Blues” throughout the World Cup in Russia, and many not already watching the game at a large outdoor viewing joined their countrymen in the streets as President Emmanuel Macron greeted coach Didier Deschamps and his players at the award ceremony in Moscow. But beyond singing the French national anthem, “The Marseillaise,” and waving their flags, crowds in Paris broke into a drugstore on the famed Champs-Elysees and took bottles of wine and champagne before being dispersed by police. Police used tear gas to try to disperse crowds who replaced the normal throngs of tourists on the central street in the early evening, and later used water cannons to blast revellers as the clock approach midnight and there were reports of thrown bottles and clashes between officers and those celebrating. One man suffered a strong blow to the head and was in serious condition as of Monday morning, according to Le Parisien. Two officers in the southern city of Marseille were injured after “many projectiles thrown,” according to police there who said they arrested ten people. Eight arrests were reported in Lyon, where a car was seen lit on fire, and seven in the city of Rouen, where tear gas was also used.